Hebrews 5:12-6:20 is a problem passage in the book of Hebrews. Some believe that this passage supports the idea that a Christian can lose his salvation. The argument of Hebrews is Christ is “greater than” or sometimes translated “better than.” This phrase is a refrain in the Greek (with different English translations) that runs that runs throughout the book. The book of Hebrews is also addressed to Christians (not non-Christians) so if anyone asserts that a passage in Hebrews is addressed to non-Christians, the onus of proof lies upon that person to prove it. The argument of “greater than” revolves around a contrast between the old covenant and the new covenant. The old covenant was a “type” and the new covenant was an “antitype” (that which against the type – in other words, the real thing, the reality). Jesus is greater than the Mosaic law, the Old Testament priesthood, the Old Testament sacrifices, greater than angels, etc. All Old Testament figures were “types,” not the “reality” (the antitype). By the way, the word “antitype” is a Greek word used in He 9:24. The immediate context to Hebrews six is 5:11-14 which is part of a section of Hebrews dealing with warnings to believers. The third warning in Hebrews runs from 5:11-6:20 dealing with immaturity in the Christian life. Hebrews 5: 11 of whom we have much to say, and hard to explain, since you have become dull of hearing. 12 For though by this time you ought to be teachers, you need someone to teach you again the first principles of the oracles of God; and you have come to need milk and not solid food. This passage contrasts a mature believer with a babe. The word “babe” is from a word meaning a child of minor age (nipios). This kind of person is unskilled in handling the “word of righteousness” “Unskilled” means without experience. It is important to experience principles of the Word rather than let them sit idle in our minds. It is not only a matter of what we know but an issue of what we do with what we know. Baby Christians lack practical experience in the Word. Christians in Hebrews five faced the problem of arrested spiritual development. They had been Christians for many years and should have been teacher by now. They needed others to teach them even the basics of Christian live, the ABCs of a walk with the Lord. They have a case of retarded spiritual maturity. The Hebrews 5 baby Christians were not babes because they were new believers for they had been Christians for some time. They had been Christians long enough “to be teachers” (5:12). However, they needed others to teach them the “first principles” of the “oracles of God (the Bible).” No doubt they had gone to church and sat under Bible teaching. But it did not take hold. To listen to the Bible without the four dynamics listed above will result in spiritual passivity, dullness, deadness and spiritual infanthood. Sitting under sound teaching of the Word does not produce a mature believer. Believers who level their development at spiritual infanthood still have need of “milk.” They need “the first principles of the oracles of God.” The word “become” indicates they reached a place that they were not before. Evidently had begun to grow but then regressed from maybe spiritual adolescence back into spiritual babyhood. It is possible to retrogress in maturity. Note the characteristics of babyhood in Hebrews 5. First the babes of Hebrews were “dull of hearing.” The non-Christian does not “receive” what God has to say because he does not have the capacity to receive spiritual truth (1 Corinthians 2:14). He is strictly a human being without the ability to know God. However, the new Christian has the capacity but it is a limited capacity. God gives this capacity at spiritual birth. The believer is a “spiritual” being (1 Corinthians 2:15) in whom the Holy Spirit dwells. The new believer has an imperfect ability to eat and assimilate God’s Word. He can make it his own if he has a desire for it (1 Peter 2:2). “Dull of hearing” “Dull” can also mean slothful, slow, sluggish, indolent, languid. This person’s ears are lazy. He is not quick to hear but slow to understand. 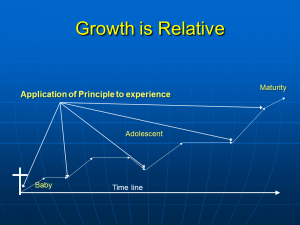 Most children desire to grow up quickly. However, the spiritual sluggard has no desire to grow. It is a tragic fact that many Christians have little desire to grow in their faith much less than reaching an edification construct (full maturity). God indicts this attitude. They acquired this attitude of being a sluggard toward spiritual things. This is a loss of “diligence.” These people are condemned to perpetual infancy in spiritual things. Hebrews 5:12-14 also sets forth three distinctives of spiritual maturity. The three maturity distinctives are rejoinders to the three immaturity distinctives. First, these believers had enough time to be “teachers:” “For though by this time [the length of time since they became Christians] you ought to be teachers…” In other words, they should have by now enough knowledge of the Word that they could teach others. They should have grown to this point. Teaching others is more measure of maturity. This implies that they knew the Bible enough to make a difference in their walk with the Lord. The second distinctive of spiritual babyhood is found in Hebrews 5:13, “for everyone who lives on milk is unskilled in the word of righteousness, since he is a child.” A baby Christians lives on milk, not solid foods. He is “unskilled” in making judgments about Scripture. He does not have the ability to see how a passage from Scripture applies to his life. The reasons are that 1) he cannot understand the passage, 2) he cannot form a principle from the passage, 3) he does not know how to assimilate into his life and 4) does not apply the principle to a given situation in his life. He lacks these “skills” to become mature. “Unskilled” means “without experience.” It is important to experience principles of the Word rather than let them sit idle in our minds. It is not only a matter of what we know but an issue of what we do with what we know. A babe is a gullible individual susceptible to spiritual inflections and diseases; he is also weak and not able to stand against the winds of false doctrine. Ephesians 4:13,14 uses the same contrast of a mature person (teleios) and a babe (nepios). He does not have the strength to stand during temptation or trial. He blows hither and thither where the wind may go. “Stature” in Ephesians pertains to our edification construct. Stature usually refers to physical height. The Greek word refers to size (hēlikia). Christians can gain stature spiritually. Our Hebrews passage says that only “full grown” people can eat “solid food” (5:14). “Full grown” connotes the idea of completion or arriving at a goal. Mature believers have fulfilled the goal of an edification construct. They have completed the maturity process of reaching the edification construct. The Greek word for maturity means complete or one who arrived at his goal (teleios). This is the completion of the maturity process. They finished the goal or God’s end for their spiritual accomplishment in time. This is a stage or state accomplished where the Christians is mature in thought and behavior (6:1). Hebrews 5:12 and 14 use a term for nourishment, to bring nourishment (ektrepho). Food sustains our lives. Mature people eat solid spiritual food. Christians are to put away childish things (1 Co 13:11) and achieve a point where they are mature in their thinking (1 Co 14:20). In order to do this, they need to have a proper diet of proper food—solid food (He 5:11-14). These verses contrast the spiritual babe and the spiritual mature. The issue is spiritual development. The difference between milk and meat in Hebrews has to do an understanding that “Jesus is greater than.” Our understanding of who Jesus is can make a difference in how we develop as a believer. Doctrine makes a difference in our development as a Christian. However, it is not doctrine alone that is at stake; it is the appropriation of that doctrine to experience that makes the difference. It is not doctrine per se but doctrine plus application that is the issue. Doctrine by itself will not allow us to grow in Christ. 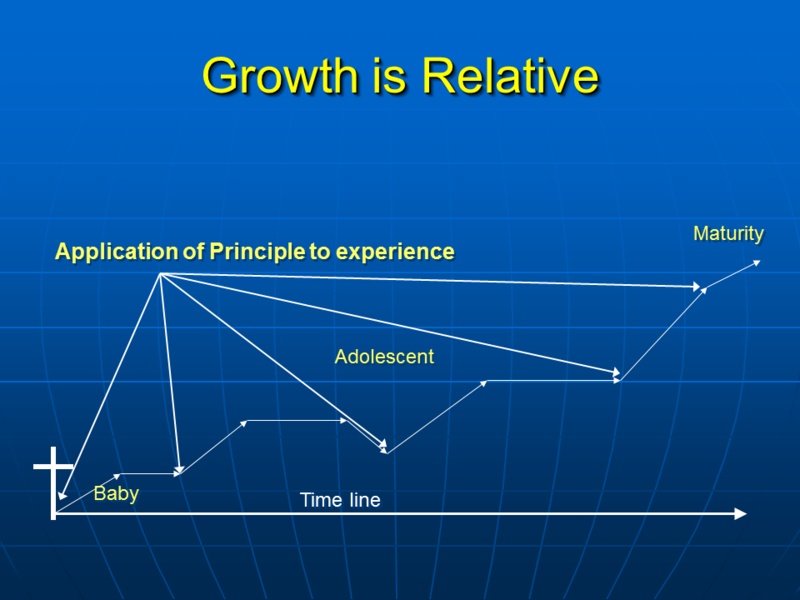 Neither will experience by itself allow us to grow. The repeated combination of doctrine and application over time produces maturity. A “babe” is either a brand new Christian or a believer that stopped growing somewhere in their Christian life. If a Christian has plateaued at babyhood after being a Christian for years, then he is like a five-year-old who is still on his mother’s breast and sleeping in a crib of spiritual dullness. His line of growth has a slight blip up but he stays at that line for years. This can happen after a believer has reached a stage of maturity. In the latter case, they have gone into decline in their spiritual life. An immature Christian views his entire Christian life from the lens of the non-Christian worldview. He cannot see what he could be because he lost value in the inspired Word of God. His assumptions about the Christian life remain small and inadequate. He cannot look at life even from the standpoint of a spiritual adult for he remains a babe in viewpoint. Normal Christian spiritual development means that a new Christian (a babe) will move to childhood through a desire or hunger for the unadulterated Word of God (1 Peter 2:2). There is no hope of moving to childhood, then adolescence and finally spiritual adulthood (the edification construct), without a hunger for what God has to say about his life. Hunger for the Word is the first step then forming a principle from the word is the next. With each new principle and application, the Christian will predictably grow step-by-step. Characteristic of baby Christians is their lack of formation of biblical principles. They do not see the value in what the Word of God can do in their lives. The reason for this is they have not acquired a taste for what the Word can do for them. They do not believe in the operational value or what forming these principles can do for them. They would rather live by their biases about life. This becomes operation bootstraps, a life lived by constricted human viewpoint. Divine viewpoint remains obscure and remote to how they live. There is a biblical belief shut-down. Their belief system is something other than what God has to say; it is what they prefer to believe. A babe is someone who is dependent; he does not function from what he has within. An infant is marked by dependence on his parents. He needs his parents for protection, food, shelter, clothing, direction. He depends on them for everything. Fundamentally, a child lacks judgment and needs the parent to tell him what to do. Mature judgment is what is needed to develop an edification construct. One qualification, it is important not to rush a new born Christian into areas for which he is not ready. This is especially true in putting them into leadership. They do not have mature judgment from a maximum understanding of the Word to make proper decisions. Spiritual maturity takes time. Some can accelerate their growth rate by taking the Word of God serious and focus on applying it to their lives. Thirdly, verse 14 says that growing Christians “have their powers of discernment trained by constant practice” to live the kind of life God has for them. These are people who partake of “solid food” and this type of food makes them “mature.” A mature person practices the Bible, not simply learns it. Instead of the mentality of depending on others, the mature believer independently applies principle to practice. If he has a trial, a temptation, he can address his need with the Word. He bases his decisions on principles from the Word. “Senses” does not refer to emotions or anything subjective. The author of Hebrews asks his readers to exercise their “minds,” to “discern.” Christians need to train themselves by “consistent practice” to make the proper discernments or judgments for daily Christian living (5:14). “Train” means to keep oneself disciplined as in athletics. A mature person can discern right from wrong: “distinguish good from evil” (v. 14). He uses Scripture to do this. Discernment is the capacity to distinguish competing values. The world system will come at us with human viewpoint, with horizontal values. A mature person can independently make judgments about the values of his life. Baby Christians do not have this ability. Hebrews 6 provides instruction on how to mature in Christ. Ultimate responsibility lies on the believer who trust in the Holy Spirit to enable him, his understanding of the grace principle and knows the Word. While the human baby may have congenital defects to keep him from maturity, there is no shortcoming to keep the child of God from growing in Christ. This chapter is a warning against reversionism in the Christian life. In context, believing Jews were tempted to return to the type when the antitype had fulfilled the type. Maturity for these Christians was to come to grips with the wonder of the Lord Jesus Christ. First, the apostle says that they were to move beyond the basics of the Christian life—they were to leave the “elementary doctrine of Christ.” “Elementary” connotes something preliminary or basic. Things preliminary belong to babes. The first imperative to move to maturity is to go beyond the basics, beyond the milk of the Word. These basics had to do doctrines that Christians had in common with believers of the Old Testament. Jews knew the type but not the antitype. They knew what illustrated Christ but they did not know Christ who was still to come. Leaving the basic doctrine of Christ meant not laying again the idea repentance from dead works. Animal sacrifice, which was a type, cannot save from sin. The “blood of bulls and goats cannot take away sin” because it was only that which pointed to the one who would actually take sin away. Mature believers are to move beyond the basic doctrine of “faith toward God.” To stop our growth in Christ at belief in God is a stunt of spiritual growth. The next area that a person who wants to grow must move beyond is “instructions about washings” (6:2). These “washings” are ceremonial washings of the Old Testament typology. Also, he was to go beyond “the laying on of hands,” which related to Jewish ordinances of identification. The Old Testament also taught other basic truths as “the resurrection of the dead, and eternal judgment.” If the believers of Hebrews did not move beyond the basics presented in the Old Testament they would not mature in the truths of the New Testament. They would abide in milk doctrines rather than in solid spiritual food. Leaving elementary principles means to move on to broader and more developed divine viewpoint. It is impossible to move to maturity without knowing advanced doctrine. Without this he will continue in spiritual childhood. We cannot believe what we do not know, “So faith comes from hearing, and hearing through the word of Christ” (Romans 10:17). Part of the definition of maturity is that maturity is a maximum application of the principles of the Word by faith.” Part of spiritual immaturity is a static faith, a faith that does not grow. 2 preach the word; be ready in season and out of season; reprove, rebuke, and exhort, with complete patience and teaching. “For the time is coming when people will not endure sound teaching, but having itching ears they will accumulate for themselves teachers to suit their own passions…” (2 Timothy 4:2-3). People want what comes from their passions not what comes from persistent study and application. They cry for milk rather than a solid meal. When we face temptation, we must draw on a reservoir of principles to address our situation. There is no time to run for your Bible at that point. The reservoir must be our own before the crisis comes. The phrase “let us go on to maturity” is the heart of the problem in interpreting Hebrews six. The definition of maturity is someone who attains the end or purpose God has for them (Jas 1:4; 1 Jn 4:18). Teleios can mean full-grown or maturity (1 co 14:20; cf 2:6; Eph 4:13,14). The “this” in verse 3 harks back to verse one—“go on to maturity.” Reversion back to type will blunt spiritual growth. Length of time of how long we have been Christians has no bearing on our maturity. We have to “go on to maturity.” Some Christians simply mark time in the Christian life but never grow. They live in protracted childhood. The foundation of repentance from dead works refers to the types of the Old Testament. Some readers of Hebrews had reverted to rituals of the Old Testament for their salvation (9:14). This is completely wrong since the Anti-type had come and fulfilled the types, which could not save but only illustrated salvation. Only Christ’s death can save the soul. There are those who believe that this passage teaches a person can lose their salvation after becoming a believer. However, as we saw in verse 3, the context has to do with “maturity,” not salvation. That context began in chapter five with the challenge to go on the meat of the Word rather than its milk. The issue is whether we are going to allow ourselves to live in prolonged babyhood. Some Christians live this way for decades. This is a case of malnutrition due to an improper spiritual diet. It takes time to mature (cf. 5:12). Patience is necessary to grow. There is no quick advance in attempting to reach the edification construct. Conformity to Christ is a huge undertaking. There is never a point when we have fully arrived but we can reach a state of maturity. It is possible to revert into immaturity. Those “who have once been enlightened” are clearly Christians. The only other time enlightened occurs is Hebrews 10:32 where Christians are in view. Those who tasted the heavenly gift refers to initial salvation. The word “shared” in the Greek means companions. People who become Christians become companions with the Holy Spirit. People who have experience the Word of God in their lives are clearly Christians. They know something about the “goodness” of the Word of God. The word “powers” is miracles. Christians know something about the resurrection of Christ. There is no “if” in this phrase; there is no condition to “fallen away.” “Fallen away” does not refer to loss of salvation but to reversion to belief in types. By reverting to the types of the Old Testament they in effect deny the work of the Anti-type, the One who could truly take away sins. And he warned that those who succumb, that is, “fall away,” after all of the great spiritual privileges they had experienced, could not be brought back to repentance. As long as Christians operate under the types they cannot have fellowship with God. They cannot truly repent if they use the wrong basis of repenting. Jesus cannot be crucified more than once. What He did, He did once for all. No further sacrifice is necessary. The author of Hebrews turns to an illustration from nature with this verse. The spiritual blessings of verses 4 and 5 descended on the believer like rain from heaven enriches the ground for growth. Rain brings a productive harvest and mature productivity in the Christian life brings blessings. 8 but if it bears thorns and briers, it is rejected [disapproved] and near to being cursed, whose end is to be burned. A Christian life that is not mature does not produce effectiveness in God’s eyes. God “disapproved” all such effort (1 Co 9:27). Disapproved conduct is in danger of being “cursed” and “burned.” “Burned” in this context does not refer to hell but to burn something worthless, of unwanted produce from the field. People cannot be restored to fellowship with God while they are in a state of reversion. Another manifestation of spiritual growth is orientation to the edification of others (6:9-10). This is a matter of serving the saints so that they come to the point of maturity. Serving saints in love is an indication of maturity translated into action. Maturity manifests itself in an outworking of the in-working Word of God. No answer to another Christian’s need is immaturity. The author of Hebrews wanted his readers to know that he had not lost hope for their maturity. He believed that “better things” would happen to them. These “better things” are things that “accompany salvation,” not salvation itself. God is not “unjust” to overlook the “work and the love” shown in Christ’s name. Christians will be rewarded for what they produce. Verses 11 and 12 challenge Christians to not lose hope in their maturity in Christ. It is easy to become “sluggish” in the Christian faith. Those who exercise active faith and persistence will be rewarded at the Judgment Seat of Christ. Having challenged believers to nurture their faith, verses 13-15 show God’s promise to those who do. Abraham was an example of someone who grew in his faith. This verse is a quote from Genesis 22:17. It is a promise after Abraham offered Isaac. Abraham waited patiently for this promise. His exercise of faith showed how he matured in his faith. Verses 16-18 show how the oath to Abraham can benefit Christians in the day of the writing of Hebrews. Jesus as the “forerunner” went into the heavenly sanctuary before us. He went there to function as a High Priest for us; He intercedes to the Father on our behalf.